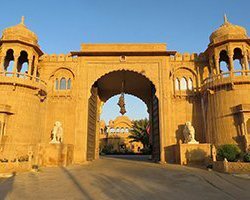 The Jaisalmer Fort or Jaisalmer Durg is undoubtedly the most important tourist attraction to visit and see in the city desert city of Jaisalmer, Rajasthan. Famed as the Golden Fort or Sonar Quila, this grand and historical fort is one of the largest fully preserved fortified cities in the world. It is a UNESCO World Heritage Site under the Group of Hill Forts of Rajasthan. Majestically standing amidst the sandy expanse of the Thar Desert (the Great Indian Desert), on Trikuta Hill, the fort houses a spectacular royal palace, and several havelis, Jain temples and houses which are finely sculptured. This grand and historical fort in the desert was constructed by Rawal Jaisal in 1156. The entire complex is fortified by three layers of walls. The Raj Mahal or the Royal Palace is a beautiful palace inside the fort complex. The Laxminath Temple is also an attraction of tourists. There are seven architecturally beautiful and superbly sculptured Jain temples within the fort complex which attract tourists. These temples are built in 12-16 century using yellow sandstone. You will be amazed to see the beautiful ceilings and carvings on walls of the Jain temples inside the fort. Sambhavanath Temple is dedicated to Sambhavanath, the third Jain Tirthankara. This temple has more than six hundred idols with several old scriptures. Ashtapad Jain Temple and Chandraprabhu Jain Temple are also popular among tourists. There are also several merchant havelis in the complex of Jaisalmer Fort. Some havelis inside the fort complex are hundreds of years old. These havelis are renowned and famous for ornate sandstone carvings in yellow sandstone and stunning decorations. You will be amazed to see a view of the golden fortress above the city in the evening. Exploring the fort complex and attractions within and outside will give you a wonderful tourism experience to cherish for lifetime.